The name Abilympics comes from the idea of organizing a competition to promote the skills of persons with disabilities. It combines Abilities with the idea of the Olympics. The concept was developed in Japan in 1972 based on the model of the skills competition named WorldSkills and on the Paralympic Games. That year, the first national final of the Abilympics was held in Tokyo under the banner “Acquiring professional skills leads to a bright future”. The International Abilympics Federation (IAF) was officially created during the 3rd International Abilympics in Hong-Kong in 1991. The IAF aims at promoting the skills competition for persons with disabilities in its international dimension. The International Abilympics are held every four years. Abilympics France represents our country within the IAF since 2013. 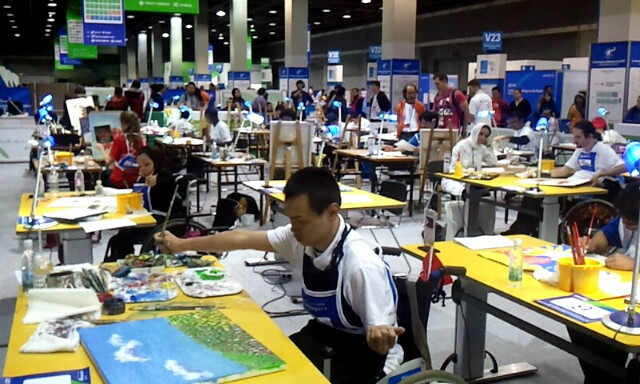 As in sports, two skills competitions coexist on an international level: WorldSkills for young people (more info at www.worldskills.org) and the Abilympics for persons with disabilities. A French specificity linked to our history and to our integrative legislation, contestants with disabilities are fully integrated in regional and national skills competitions. They compete under the same conditions, during the same contests and with the same evaluation system as others in order to be selected in the national team for representing our country in the WorldSkills and Abilympics world championships. At the instigation of the French Ministry of Work and of the Secretary of State in charge of Persons with Disabilities, France will be hosting the 9th international skills competition for persons with disabilities in March 2016.